The critical thinking "Elements" poster started me on a journey that brought an awareness that critical thinking should be approached as a way of life rather than simply as a task to complete. I am learning to think critically in the disciplines in my major, but more importantly, I am beginning to think critically in my life. The i2a critical thinking posters are a set of 3 individual posters created as part of the UofL i2a initiative. Each poster features a set of learning prompts related to critical thinking and customized for use by UofL faculty, staff and students in classrooms, conference rooms, and other virtual or face to face learning contexts. Each new poster focuses on a distinct component of the Paul-Elder framework: Elements of Thought, Universal Intellectual Standards, and the Intellectual Traits. These posters are adapted from the Paul-Elder framework and printed and distributed with permission from the Foundation for Critical Thinking. I found these exceptionally useful last semester. I could readily point to them in the regular conduct of the class; it served to reinforce the seriousness with which students should consider critical thinking. They made it so much easier to engage students in the effort to get them to use critical thinking Elements. The posters facilitated more in-depth conversation and it made students say 'I haven't thought about it in that way.' Very thought-provoking and challenging for them, but helped take the discussion to a deeper level. The posters are designed to serve as learning or discussion tools with prompts that can be used individually or in multiples to foster critically thinking through an issue, topic, question or problem. Using either a single poster—or a group of two or three—faculty, staff and students can use the posters to create a consistent but flexible framework to explicitly incorporate critical thinking into a discussion, assignment, lecture, group work, meeting or course or event design. The quotes above from UofL faculty indicate how the posters can be incorporated into lectures or discussions to help students think with depth and breadth about the topic or issue at hand. 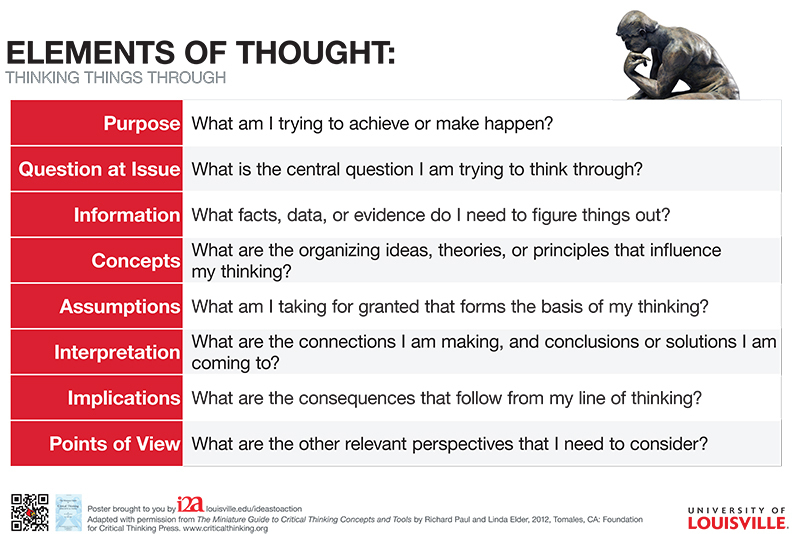 The Elements of Thoughts poster has questions that can help learners thoroughly and systematically think through an idea, question, problem or topic. (e.g. "What are the organizing ideas, theories, or principles that influence my thinking?"). These questions can be helpful to support students in analyzing a text, idea, concept or framework. 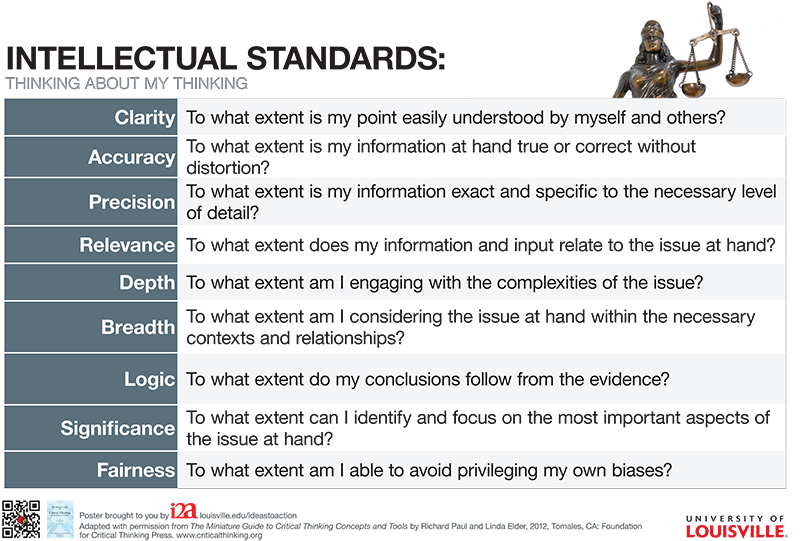 The Universal Intellectual Standards poster has prompts to help thinkers reflect upon, and enhance, the quality of their thinking while they are drawing conclusions, evaluating others' thinking, or carefully considering information, questions or assumptions ("To what extent am I engaging with the complexities of the issue?"). These questions and the standards themselves can be used to support students' reflective activities, instructors' exams, rubrics or other assessment tools. 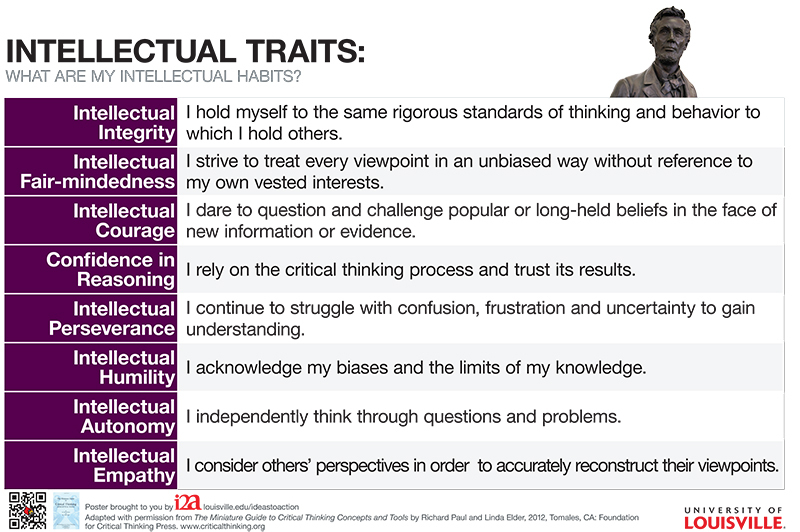 The Intellectual Traits poster features affirmative statements that encourage thinkers to be self-reflective and self-aware about their habits of mind. These statements are designed to encourage learners to become fair-minded in their use of critical thinking tools and strategies. (e.g. "I continue to struggle with confusion, frustration and uncertainty to gain understanding." These statements can be used by instructors to make explicit the "mental moves" and thinking behaviors that students can learn to develop through the course of an assignment, semester, or across semesters.